It is so easy to research a company, and it can make such an enormous positive impact on your job search, there is absolutely no good reason to skip this step when you are job searching. Here's why you need to do effective research, and how to do it using some effective strategies. In a hurry? Here's a summary of everything you'll find on this page. Click any of the links to jump down to a specific topic about doing good research. Taking some time to research a company every time you write a resume and cover letter, and every time you go to an interview is one of the easiest and most effective things you can do to stand out from the competition and make a great impression on employers. Good company research will give you insights into the employer's specific needs that won't be obvious just from a job ad or any other job lead source. You can use that information to write a resume and cover letter that is tremendously well targeted to addressing the employer's needs, including those needs that were not expressed in the ad. If you know more than other job seekers about the company's specific needs, you will be able to write a cover letter and fine tune your resume to specifically address those needs in a way that your competition will not do. You'll be able to go beyond describing professional skills that everyone in your line of work has and highlight special skills and experiences you have that fit ideally with the company's needs. The employer will see you as a perfect match for the company, not just another applicant with the same skills everyone else has. You would probably be shocked by the number of people who do not research a company before an interview. Because a lot of people don't do much research, if you do, you will easily stand out from your competition. Most interviewers will ask why you want to work for their company or what you know about their company. You cannot answer those questions well if you haven't done any research. When you can demonstrate to an interviewer that you have a good understanding of a company's business as well as its priorities and values, you will make a great impression. If you show that you know very little about the company, an employer will think you are not particularly interested in the job. In addition to being able to answer specific questions about the company, when you research a company well, the information you find about a company's needs and priorities will help you to decide what skills to really highlight in your interview because you will know what is most important to that employer. The company's website, Facebook page, Twitter feed or Pinterest page will provide you with good information about the company. If the company is active in social media, follow them. A company's social media presence is often more personal and less formal than their website, so it may give you some excellent insights into the company's priorities. By searching for the company's name in a major search engine, you might, depending on the size of the company, find websites that do not belong to the company, but have useful information about the company. Looking for news stories about the company can give you some insights into new and important developments. If you have the name (or names if there's more than one) of the person who will be reviewing your resume or interviewing you, try looking them up on a professional social site like LinkedIn. By reviewing their professional background, you might find some common ground or get a better sense of their work-related values and priorities. Do be a bit careful with this strategy. You don't want to appear "creepy" in a job interview. Don't reveal every detail you learn about the person; it will likely make the interviewer uncomfortable. Instead, use the information in a general way to determine what skills, values and experiences you want to highlight in your interview. These directories can give you some basic information about the size of the company, the type of business they are involved with, and sometimes the names of key people in the organization are included in the directory. Business directories are available online and/or in paper form. Online versions are often more reliable than hard copies because they are more likely to be up to date. However, sometimes business directories can be tricky to find online, particularly if you don't know the names of all of the business directories in your area. If you visit your local library or employment resource center, the staff there will be able to show you the local business directories. 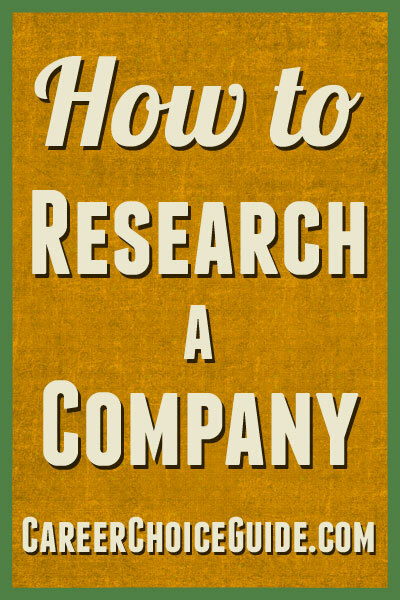 Simply asking around can be a great way to research a company. If you can find someone in your circle of friends and acquaintances who has some type of connection to the company, you may be able to get some very candid and helpful information about the company that you could not find anywhere else. Specific type of products or services the company provides. Type of customers or clients the business serves and any very specific expectations those customers have that you may be able to meet. Specific challenges the company may face that you would be able to address. New developments the company has planned, particularly projects that would require specific experience or skills that you have. Approximate size of the company. Key people within the company. Key philosophies of the company. Once you have a basic understanding of a company's goals and needs, you will be able to highlight on your resume skills and experiences you have that demonstrate that you are able to help the company meet its goals. For example, if you discovered that a company was launching a program to support people with low literacy levels, and you had experience working with people who had low literacy levels, you would want to include that information near the top of your resume in a way that stood out. A simple way to tailor your resume based on the information you have gathered is to use a combination resume style and include points that are relevant to that employer at or near the top of your skills summary. With good company research, you will be able to write a cover letter that addresses the employer's priorities. Job seekers who fail to do good company research will not be able to address an employer's needs in the same way in a cover letter. Simply take some time to think about what the employer's needs are, and how you can meet them based on the job you are seeking within that company and with the skills and experience you currently have. Once you have figured out one or two ways that you could meet that company's needs, be sure to write about that in your cover letter. You should never go into an interview without (at the very least) having a basic understanding of the type of work a company does, the clients or customers they serve, and a couple of points that illustrate that you have the skills and experience required to help the employer fulfill his or her business goals. Some people mistakenly think you need go into an interview able to spout all kinds of figures about a company's annual earnings and stock prices. Unless you are applying to a very high level position within a large organization, that type of information is almost never necessary in job interview. If you would not use that type of information in your job, you don't have to memorize it for an interview. Think about the type of information you would need to know about a company in order to your job well every day; that's what you need to talk about in an interview. Depending on the type of work you do, that information may include customer needs, plans for new product development, major competitors in the industry, or community partners and resources. Also, it is perfectly acceptable to bring notes from your company research into your job interview. You do not have to memorize hundreds of facts about a company. Simply format your research in a way that looks professional and is easy to read (typing up a few point form notes is ideal for many people), and carry it in a professional looking folder. You can take time to review those notes while you are waiting to be called into the interview, and if you have to glance down at the notes a couple of times during the interview, that is perfectly acceptable. If you do bring a few notes into your job interview, be sure to avoid simply reading notes throughout the interview. If you spend most of the interview with your head buried in your notes, you will not make a good impression on the employer. If, on the other hand, you glance down at notes a couple of times for reference, reasonable employers will not take issue with that. It is easy to research a company at the interview stage of your job search, but it can be more challenging to find out information at the resume and cover letter writing stage of your job search, particularly if you are applying to advertised jobs, and there is no company name stated in the ad. You won't always be able to find out the name of a company from the information in a job ad, but sometimes a little bit of detective work will allow you to figure it out. If you are given the option to submit your resume by email, the company name may be right in the email address. For example, if the ad says to email your resume to john.employer@123fakecompany.com, then the job ad is likely for a job at 123 Fake Company (or whatever the email extension happens to be). Use a search engine to look for information about 123 Fake Company to confirm your suspicions. If you find a job that has been posted by a recruiter or perhaps a temporary agency, and you'd like to try to determine the name of the company that is hiring, copy a section of the job ad, paste it into a search engine, and see what results you get. Sometimes, the employer will have advertised the job elsewhere using the same text, and if you can find other instances of the job ad online, you might be able to find one that states the employer's name. This strategy won't work all the time, but it takes seconds to do, and sometimes it provides some very helpful results. When you choose the text to copy and past into the search engine, look for sentences that have unique words and phrases to increase the change of finding any matches that might exist online. There are free websites that allow you to check a selection of text or an entire web page for plagiarism. These sites are immensely helpful to teachers, as well as people who write websites, and they can also help job seekers. In your case, you are not worried about plagiarism. Instead, you are looking for additional instances of the job ad online to see if you can find another copy of the ad that provides more information about the employer. Find a free plagiarism checking website. At the time of this writing, plagiarismchecker.com is free and seems to be effective. Paste a chunk of text from the job ad into the appropriate box on the plagiarism checking site, and search for additional instances of that text online. You might come up with other versions of the same job ad that will give you additional useful information about the employer. An online reverse fax directory is simply a website that will allow you to enter a fax number, and it will tell you who that fax number belongs to. These directories can be helpful if an employer posts a fax number. Of course, faxing your resume is becoming less and less common, but you do still come across some job ads that include a fax number. If you have a fax number, try looking it up in a reverse fax directory to see if you can find the employer's information. These techniques to research a company when you don't have a company name will not work every time, so if you have tried the above steps, and you still do not have a company name, do not spend any more time trying to find the company name. Simply go ahead and write the best resume and cover letter you can write based on the information you do have.